Without a doubt, so much of our success and well-being as an entrepreneur really comes down to our mindset. Being able to ward off negativity when it strikes, and to keep a positive attitude in all areas of our life, is what can make or break it for us. Whatever the reason, it’s important to be armed with ways of being able to clear the negative thought pattern and bring on a positive mindset again for those times when we are feeling down or overrun by negative thoughts. The most effective way to cleanse your mind of negative energy is finding the source of your unhappiness; more-so, the root of what is directly causing these negative thoughts to surface. You can do this through a simple guided meditation exercise where you ask yourself: “What’s causing me to have these negative thoughts?” Your happiness lies in finding a solution to your answer. Find a quiet place to sit and reflect. You might like to light a candle and sit in your own sacred space with some essential oils diffusing. Close your eyes and feel into your body as you identify the root of your unhappiness. Allow your thoughts and feelings to reflect how this thought is affecting you. How does it make you feel? At this point, decide what you would like to replace your negative thought with. Perhaps a word or phrase, an action, or a happy memory. Feel yourself releasing the tension and negative thoughts from your head to your toes. Visualising the tension exiting your body and replacing that space with positivity is the key to permanently ridding yourself of these negative thoughts. Soak it in and let it absorb the empty space of negativity that has left your body. This takes time, perhaps as short as 3 minutes, or as long as 10 minutes. However long it takes, ensuring you have completely detached from the negative thought is important. Any stranded thoughts can resurface into the negative energy you are working at resolving. You might like to then take some time to journal down any further thoughts and feelings that have bubbled to the surface which are still making you feel unsettled. I’m a huge believer in the power of journaling as a way to clear our thoughts and make space for new ideas and a positive mindset. You could even journal on what I call the My Greatest Life exercise. Imagine what your greatest life would like if time and money were no issue. Jot down in your journal what would you, living your greatest life, really look and feel like? This can be super empowering and help to get us out of a funk, as we can realise that much of what we want is actually well within our reach if we just look at things from the right mindset. I also love to work with crystals and oracle or tarot cards. These tools can be really helpful ways to realign our thoughts and to make powerful intentions that can help shift our thinking into the right direction. The guidance that the words and pictures can support us to tap back into our power. Other useful physical tools to aid us as we work through the mental and emotional clutter that is keeping us down are essential oils. Diffusing some uplifting oils such as Joy, Citrus Fresh, Stress Away or a delicious blend of Peppermint and Valor always helps to bring me out of mental funk. It’s also really helpful to talk to people about how you’re feeling. I love to connect with my business bestie in those times where I’m really feeling anxious or stressed, or even just reaching out to other entrepreneurs in Facebook groups I’m in- it can help to clear the negativity (the Facebook group that I co-host, Healthy & Wealthy Women Entrepreneurs, is a fabulous sounding board for times like this! It’s free to join!). It’s important to remember that you’re never alone and that it’s completely normal to have bad days and down moments as we embark on this entrepreneurial journey. The trick is being able to recognise when your thoughts aren’t helping you and to take action on getting your thinking back on track again. Print out this post and leave it somewhere that you can read when you need a reminder. Anytime you feel negative energy creeping your way, commit to this quick yet effective guideline to cleanse your mind of negativity and get thinking and feeling positively again! Still struggling to juggle it all and stay on top of your game? Let's work together! 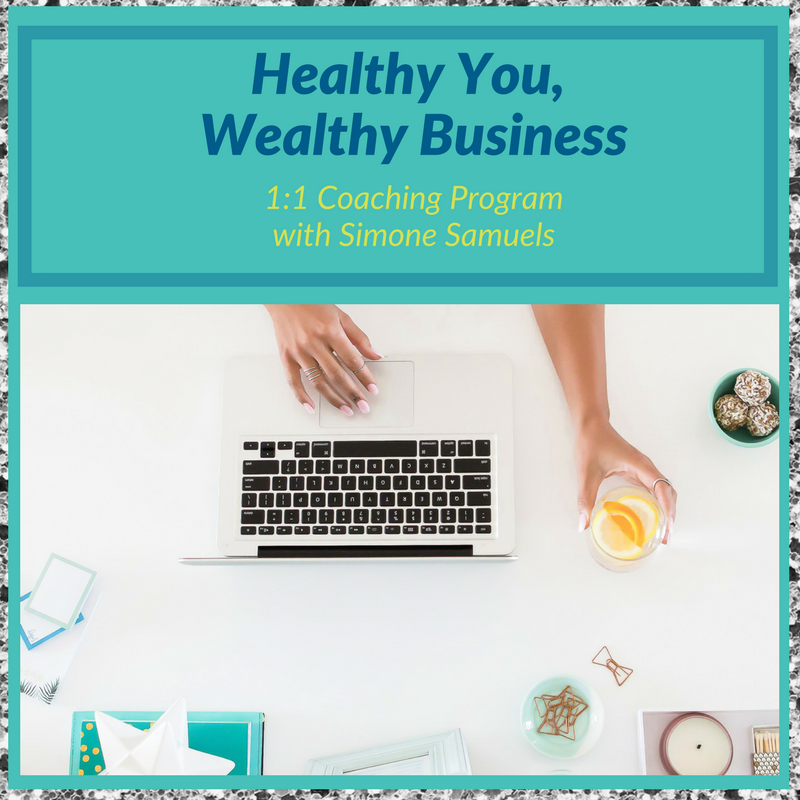 My 1:1 Healthy You, Wealthy Business coaching program includes a 90-minute judgement-free session. Together we’ll develop your personalised success plan to keep you accountable, focused and on-track in both your business and healthy lifestyle, without the stress and overwhelm, so you can find fun in your life and enjoy your business and your life again. Go here to book your session!